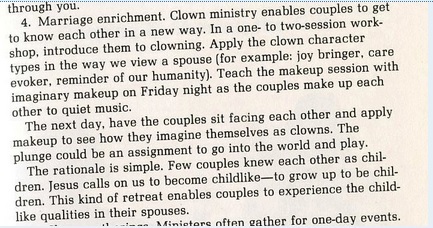 Submitter: This bizarre book includes makeup tips, skits based on Bible verses, and other odd ideas – I included scans of my two favorites, “clownseling” & Marriage enrichment. Thankfully for those scared of clowns, the library’s name label obscures most of the clown’s face on the cover. Holly: For that, Mary is grateful. I bet she’s still creeped out, though, actually. Books on clown ministry aren’t so weird for a public library collection. This one is…yes, you guessed it…old. Does this sound remotely intriguing to any married couples? Yikes! More like grounds for divorce if I suggested it [I wouldn’t!]! Good gravy. This is the most horrifying thing I’ve ever seen! What are the skits like? Does God say to Lot’s wife, “Don’t look back or I’ll turn you into a clown!” That would have been much more effective than that pillar of salt threat. But wait! YES, because the characters in Godspell traditionally dress like clowns, right? So clowns and Christianity go hand in hand – as do clowns and kickass music, if we go by the same logic. That said, I think if you and your spouse are putting clown make-up on each other with soft music playing in the background…… well, wait, YES AGAIN! Because if you and your spouse are doing that together and enjoying it, you’re clearly meant for each other! So I absolutely approve of this book, 100%, it’s a keeper. P.S. One of the things I’ve learned in therapy recently is to Be Mindful and Evaluate Situations Non-Judgmentally. Hence my approval. I’ve thought about it a lot because a lot of people don’t understand it, and I think I dislike clowns because they fall into a bit of an “uncanny valley”. It’s like they’re just not quite human, and it gives me the willies! It’s not like I have paralyzing clown nightmares or anything, but they do make me feel vaguely uncomfortable. This book just look hilarious. I wonder what its circ stats are? That’s just creepy. If that clown showed up I’d run screaming in the other direction and I don’t run. This has to be the strangest book I’ve ever seen. I have this weird urge to track it down and see it in person but I’d have cover that clown on the cover because I’d expect him to come out of the book and kill me in my sleep. Egads, what a perfect synthesis of two things that terrified me as a child – clowns & christianity! I wonder if this book is in the library at the Fool’s Guild. I feel like I saw a daily show segment on this… Clowns for Christianity or something. “Clown” as a verb really freaks me out. I still get the heebie-jeebies when thinking about the clown worship service at summer church camp. I secretly hoped I’d end up with poison ivy or something equally debilitating so I could spend that hour in the camp infirmary. It is embarrassing to see grown adults dressed up like clowns and praising Jesus. So—clowns mean well, they’re just terribly misguided. I still hate them. They’re so aggressive. It’s like watching someone blow up an old balloon. You know it’s going to blow up in their face, just not exactly when. Christianity deserves better. “I wonder if this book is in the library at the Fool’s Guild. In answer to why some people don’t like clowns… I can only speak for myself. I think it’s because, on some level, the obvious hiding of the person’s true nature under a cheery, over-the-top persona designed to make you think they’re fun and happy and so on triggers something in me that says, “This person is hiding something – and its evilness is direct proportion to their attempts to make it appear harmless and happy.” It’s way too easy to evil to hide under a clown face. They also divert attention from their own persona by ridiculing others (kick in the pants, laughing at practical jokes, etc.). And everything they do, no matter what, is done with the same over-hearty laugh and painted-on happy face. I can easily imagine them committing unspeakable crimes against humanity with the same enjoyment they display pouring water down someone’s pants, and with the same lack of remorse. So, on some level, part of me is convinced only evil would need that much camouflage. It totally skeeves me out. Aren’t their enough clowns in organized religion already? Thank you. Thank you. I’ll be here all week. The only time I didn’t attend Mass in seminary was the evening they had a Clown Mass. One simply must draw the line SOMEWHERE!!! I’m guessing this is from the early 70’s – I remember seeing a film in sunday school with a clown – I’m sure it was about love or service or something, but it completely freaked me out. We had a member, too, who would dress as a clown in church sometimes to bring “joy” to worship. I appreciate the intent, but never have like clowns. I am now a Presbyterian minister and I love to bring new things to worship with humor and drama, but never with clowns. I’ve never heard of the clownseling – wow. The 70’s were quite the decade. p.s. I think the “uncanny valley” comparison is right on target. I know some one who is frightened of clowns and has PTSD from a clown he witnessed murdered a person with a gun. I am against book burning–but I’d be willing to make an exception in this case. Someone needs to kill this with fire…. 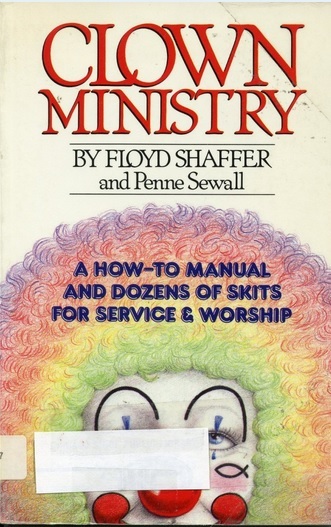 I am quite disturbed by the clearly prejudiced comments about this book, clowns, and ministry. While what is being said has an element of truth, it is based on stereotypes, preconceptions and a limited exposure to clowns. Yes, some clowns are terrible, loud, obnoxious and scary. Aggressive clowns can be particularly annoying and scary. This does not mean that all clowns are scary and annoying. Yes, some Christian Clowns are horrible, but this does not mean that all Christian Clowns are horrible. I know many clowns and they are mostly fun and caring individuals who wish to entertain people and help them to smile. If you have a problem with clowns or clowns in ministry, then avoid them. Don’t try to rationalize your fears, misconceptions and distaste by demonizing all clowns. If you have a serious problem with clowns, maybe you should be seeking counscelling. Lighten up Michael. Most comments I’ve read here are tongue-in-cheek, not prejudiced. Configure your rss please, I reading blogs news via rss reader, thnks.